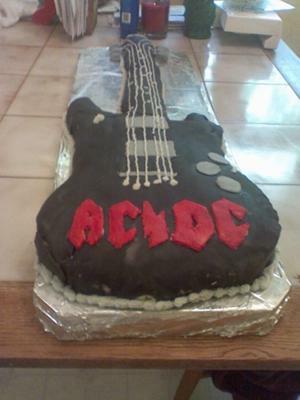 To make this AC/DC Cake, I used a guitar hero guitar as a base for my idea. Then drew it out on paper first. Then transferred the body of the guitar on to one 9x13x2 cake and used another of the same size to cut of the neck and rest of the guitar. I used black fondant to cover and red for the lettering. Join in and write your own page! It's easy to do. How? Simply click here to return to Guitar Cake.